Excitement fills the air when communities unite for a worthy cause. Suwannee Valley Rotary Club holds this very exciting event each year on the first Saturday in June to unite the Tri County Area and involve hundreds of cyclists from all across the country. Our annual “Tour de Melon” event corresponds with Chiefland’s popular, well attended, Watermelon Festival. The “Tour de Melon” is a bike ride on the Greenway trail which connects Levy, Dixie and Gilchrist Counties. We offer a Century Ride (that’s 100 miles!) and a Half-Century Ride (that’s 50 miles!) for the more competitive riders. Support and refreshments are stationed along these routes, including the scenic Old Florida trail. 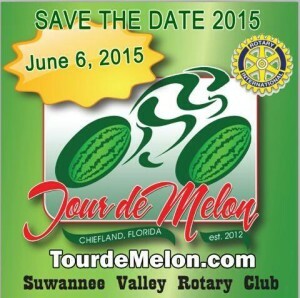 Tour de Melon is advertised state-wide through numerous media outlets! Event organizers anticipate approximately 300 riders for this premier event! Importantly: The Suwannee Valley Rotary Club’s “Tour de Melon” fundraiser benefits the youth and local civic groups in our area.